This is what a destination wedding looks like! Samantha Ruth Prabhu and Naga Chaitanya are married now. 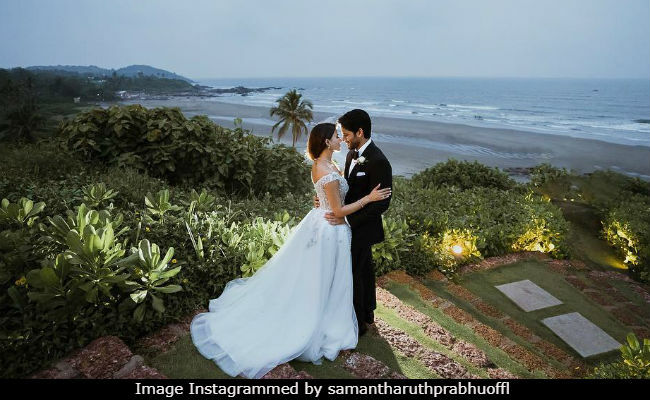 The two South stars got married in two wedding ceremonies in Goa recently, glimpses of which are plenty on Samantha's Instagram. The star couple married according to Hindu rituals on October 6, which was followed by a Christian style wedding on October 7. Samantha has hand-picked the best moments from her destination wedding to fill up the wedding album and it has sugar, spice and everything nice. Courtesy for the stunning photographs go to Joseph Radhik, who has been chronicling intricate details of the beach-side wedding on his page, titled Stories by Joseph Radhik. However, we only have Samantha to thank for treating her fans and followers with delightful behind-the-scenes glimpses from her two-part Goa wedding. For the Christian wedding, Samantha walked the aisle in an embellished gown from the studios of designer by Kresha Bajaj, who had also designed the actress's reception outfit. A suited Naga Chaitanya complimented the bride in style. My beauties @meghnavinod @kreshabajaj @pallavi_85 #malavika . My cutie . @bridesofsabyasachi @nacjewellers DREAM!! Here are dream like pictures from the mehendi ceremonies. The couple were colour coordinated in shades of pastel. Samantha Ruth Prabhu and Naga Chaityana will also have a lavish wedding reception in Huderabad, the date for which is still not known. Samantha Ruth Prabhu and Naga Chaityana are co-stars of 2010 film Ye Maaya Chesave, their first movie together, on the sets of which they fell in love.